Treat your Dad to a day at the pub! We're celebrating all the Dads out there on June 17th with some rockin' brunch specials and a dinner buffet that is HALF PRICE for Dad! French Style Omelette stuffed with Honey Smoked Salmon, Capers, and Julienne Red Onion. Topped with a Boursin Style Cheese and fresh Dill. Served with fresh fruit and a choice of Toast. Be at Rare Olde Times for the best Paddy's day party in RVA! 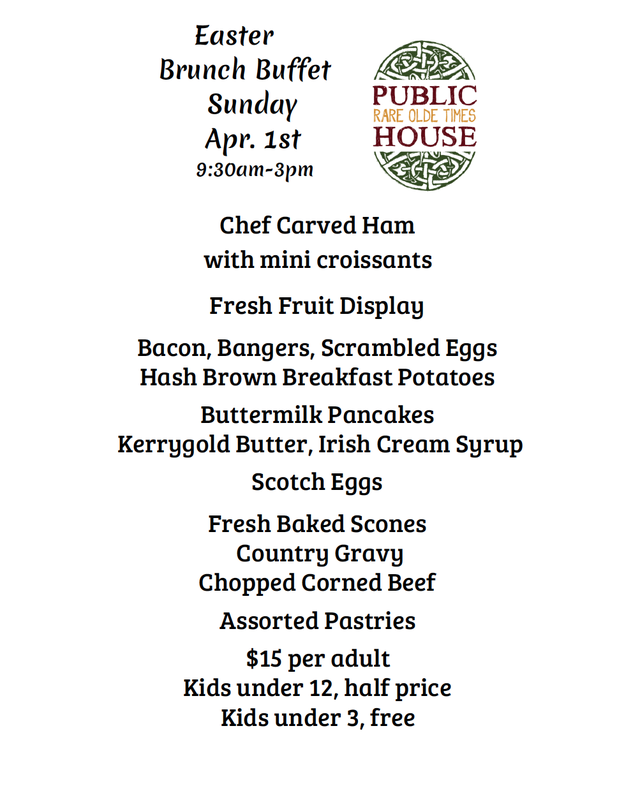 We are kicking off the festivities early this year with an Irish Breakfast buffet starting at 9:30am and then going all night long with music from some of your favorites...Bagpipes from Tim Batten Macleod, The Donnybrooks, Albafeire, The Tasty specials, and cloing out the night with Uisce Beatha! Irish food and drink available all day/night! If you're just looking for sold tasty Irish food without all the maddness of going inside an Irish pub on Patrick's Day we will have our "Irish Rover" food truck outside for to go orders. After all the festivities are over be sure to join us for our Hangover Brunch on the 18th for some Celtic tunes and tasty hangover fare.